It’s all hands on deck for the annual hovercraft races at UBC Okanagan next week. As the end of UBC’s winter session approaches, students in the School of Engineering are putting the pedal to metal and demonstrating the skills they have learned this past year. Three major events are planned next week, and Assoc. Prof. Yang Cao says these year-end projects are treated like rites of passage for engineering students. While it’s all about marks and demonstrating what they’ve learned, there are also bragging rights and awards for the winning teams. Cao encourages the public to visit campus during any of these events to get an idea about student projects in the School of Engineering. When: Wednesday, April 8, 5 to 7 p.m. The School of Engineering showcases the final design projects of the first-year engineering class. Students picked one of three projects: one suggested by UBC faculty and two ideas from Kelowna’s Clubhouse Childcare Centre. 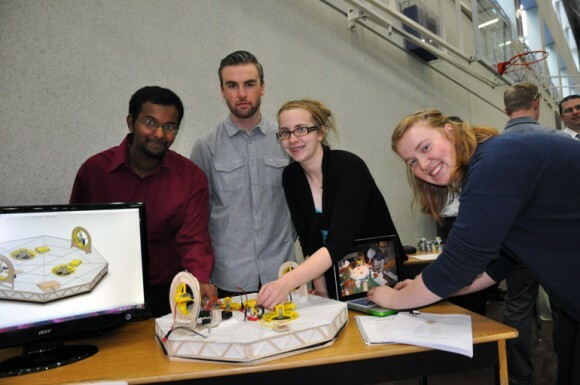 Student teams and their projects will be judged by faculty and prizes are awarded. Design competitions options are: an off-the-grid office heater for warming UBC faculty and staff offices; designing a musical instrument for an outdoor music garden; or designing a station where children could wash after playing on farm grounds. Teams and their projects will be judged and prizes awarded. When: Thursday, April 9, 8 a.m. to 1:30 p.m. The School of Engineering demonstrates the results of the integrated second-year design project. The goal is to construct a moving platform (hovercraft) which satisfies requirements in three major areas: structural design; fluid mechanics; and control systems. The crafts, built from balsa wood and powered by four fans, are required to carry a minimum weight of one kilogram. At this event, the hovercrafts will be evaluated by engineering faculty and tested for speed and weight capacity while being remotely guided through an obstacle course around the gym. Parents and the public are encouraged to attend and cheer for their teams. When: Friday, April 10, 1 to 5 p.m.
Fourth-year engineering student showcase their final year Capstone Design Projects in a public poster presentation session. Many of these challenging projects were proposed by local industry collaborators and topics range across many areas, including sustainable building materials, alternative heating systems, pipeline health monitoring, mountain bike design, and unmanned aerial vehicles.